Data experiences close companionship aboard the U.S.S.Enterprise NCC-1701-D with SPOT, a domestic cat who lives in his quarters aboard ship. Like most cat`s, Spot is particular about what food she eats, and Data, with infinte machine patience, creates at least 74 varieties for her to sample. Prior to the installation of his emotion chip, Data enjoys Spot`s company. But afterward, following the crash landing of the Enterprise`s saucer section on VERIDIAN III, Spot provides Data with a unique lesson about the complexity of emotions. Upon retrieving his pet unhurt amongst the wreckage, Data responds by crying, even though he feels happy, in the face of those conflicting responses Data believes his emotion chip is malfunctioning. Fortunately COUNCELOR DEANNA TROI is able to reassure him that his behavior indicated his chip is working perfectly. The most profound relationship Data experiences on board the Enterprise is also one of the briefest. In 2366, Data duplicates his own neural network in a new android body, which he names LAL (HINDI FOR BELOVED). At first, Lal`s body is featureless, but as part of it`s development the new entity selects a human female form, becoming, in a sense, Data`s daughter. The creation of a new android based on Dr Noonien Soong`s work attracts the attention of ADMIRAL HAFTEL. As a cyberneticist,Haftel wants to use Data`s recreation of Dr Soong`s work, and tries to get Starfleet to assume possesion of Lal in order to study her in controlled conditions and under the expert guidance of cybernetics speecialists at the DAYSTROM INSTITUTE annex on GALOR IV, tragically , the fight over the stress of the fight over Lal`s rights as an individual leads her to develop emotions, including love for her "father", and regret about her own impending demise, which in turn causes the fatal failure of her neural matrix. Lal ceases to function after little more than 2 weeks of life, leaving her Father Data to continue with his quest to understand life, alone. 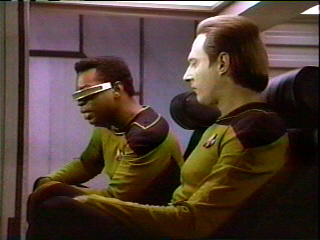 Data`s closest acquaintance during his time aboard the U.S.S.Enterprise is GEORDI LA FORGE. Their long-term friendship begins in 2364, when both come aboard the ship, Data as Chief of Operations and La Forge as Flight Controller. La Forge`s promotion to Chief Engineer in the next year reflects his expertise with machinery, though he experiences difficulties in establishing relationships with other people, especially women. These personality traits may account for La Forge`s ability to so easily maintain a relationship with Data, a sentient machine. Tellingly, a key turning point in the friendship between Data and La Forge comes in 2371, when Data makes the decision to have Dr Noonien Soong`s EMOTION CHIP, recovered after being stolen by Data`s "brother" LORE, installed in his neural net. La Forge`s presence while Data makes that life-altering decision indicates the closeness they have developed. However, La Forge later reacts negatively to the erratic behavior which accompanies his friends initial acquisition of emotions, and threatens to have the chip removed.